Populouz is an Latina, Woman, Veteran, and LGBTQ owned and operated business so it's only natural that I care about, and passionately support, open dialogue about issues of race, sexual orientation, gender identity, and disability as it pertains to the technology field. Simply put, if we can't have open and respectful, data-driven, conversations about this issue nothing is ever going to change. In years past, #techInColor partnered with a local nonprofit who, in one way or another, is helping uplift people of color, members of the LGBTQ community, women, or folks from economically disadvantaged backgrounds. #techInColor recruited sponsors to cover our event budget, which we kept lean as possible so that any net sponsorship dollars go to the nonprofit as an unrestricted gift. For 2016, #techInColor introduced "Success Hacks: Paving Your Own Way In Tech" to help open up the dialog about the hopes and dreams that diverse technologists in the Philadelphia area have for their careers and some of the real challenges they face due belonging to one or more flavors of "Diversity". Check out the video of our first panel discussion where we heard from trainees and interns at Hopeworks N' Camden. For three years in a row now Kevin Taylor partnered with other technologists in Philadelphia, to organize #techInColor. This annual event celebrates the diversity we have in our tech community here in Philadelphia. This annual event is a passion project and is one of my favorite parts about working in the tech field here in Philly. #techInColor was amazing opportunity to connect and grow relationships with some of the most dynamic, exciting, and talented technologists in the region. Their enthusiasm is contagious, their ambitions are inspiring, and their stories are both humbling and eye opening. Over the years, the #techInColor event grew in popularity enough to earn news coverage of their efforts. To paraphrase one of the co-organizers, Tracy Levesque, web designer, developer, and co-owner of YIKES!. While we are hopeful that merit counts more than race when it comes to building a career technology, the stats reveal that optimism maybe not warranted. Let's take a look at some data on the subject, just as a conversation starter. This 2013 Article on NationalGeographic.com profiling "6 Women Scientists Who Were Snubbed Due to Sexism" describes the shameful way patriarchal norms robbed women of their due credit for major scientific breakthroughs and discoveries ranging from the discovery of pulsars to the discovery of DNA's helical structure. While some readers might note that many of these acts of sexism occurred in the mid-20th Century, when we know sexism, sexual harassment, and violence towards women were commonplace. Some people want to believe we have moved beyond such unsophisticated modes of thinking, but this is not the case, "Guess again." As recently as 2012, an academic study indicated that subtle gender bias may still be alive and well in academic settings. We often are asked the question, “How can we build a diverse organization?” and we often answer that the first place to look is at your hiring practices. Human Resources professionals may be aware of the issue of racial bias in hiring, however, few of them may have received the requisite training to conquer any unconscious biases they may carry. This isn’t an isolated phenomenon, but research suggests this problem is prolific (here is a link to an example of this kind of research). As a result, this kind of unconscious bias in hiring makes building diverse organization very difficult. While this bias in the minds of HR recruiters and hiring managers may not be an intentional thing and may occur on a subconscious level, it underscores the need for intentional training on this topic. However, long before Admiral Hopper made her great contributions to the field of computer programming, we have Alan Turing, credited with being the father of theoretical computer science and artificial intelligence. Alan Turing was also living as a closeted gay man at a time in British history when LGBTQ folks were treated as mentally ill criminals. Despite Alan's contributions to the Allied Forces winning World War II, which most likely saved countless lives and saved us all from Nazi fascism, the British Courts convicted him of, "Gross Indecency." The British Press vilified Alan, and the courts sentenced him to chemical castration. On June 8th, 1952, Alan Turing was found dead, and it's believed that he committed suicide by ingesting cyanide. While there is some speculation about the cause of death and whether it was an accident, we believe it was suicide. A 2002 study published in the American Journal of Public Health presents research indicating that LGBTQ folks are at an increased risk for suicide and credible health authorities attribute this to the social biases against LGBTQ folks. Populouz is proud to operate out of Philadelphia, a city recently rated as one of the most LGBT-friendly cities in America. However, we are not blind to the fact that many LGBTQ folks live in areas of the country where they face employment, housing, and other forms of discrimination, violence, and social isolation. So what does this have to do with gender bias in technology? 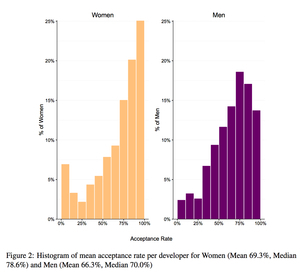 Graph from Ars Technica showing statistically reliable analysis that women are reliably less likely to have their code contributions to open-source software projects accepted if they can be identified as female. It's simple, even in a career field that is routinely held up as being more based on meritocracy than appearances, guess again. Ars Technica recently published an article about gender bias in GitHub code commits. The article describes how code contributors are treated by project leads if the lead can identify the contributor as female. In short, if the lead can identify the contributor as female, and the contributor is new or unknown to the project, the stats indicate a reliable bias in whether or not the lead will accept the code into the code base. This graph from the same Ars Technica Article shows that women are more likely to have their code merged into the final code base for the software they are contributing to. What's truly interesting about this article is that when you look at the number of code submissions merged into the final product you see a rather impressive set of numbers. 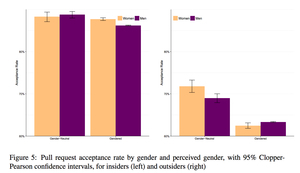 The graph below demonstrates that project leads accept code submissions by women at higher rates when compared to male contributors. Simply put, there is every indication that women produce better code than men. The authors of the study attribute this to the sheer grit and hard work women have to put into their work as software developers for project leads to considered their code as good as a man's. In other words, men can get away with subpar work, but not have to deal with the professional consequences of subpar work products. Each member of the Populouz family has a personal commitment, both as professionals and as citizens, to try and treat all people with respect and dignity. Our goal might sound simple, but it's not. It takes effort and commitment because it's not as simple as just being polite to folks. It requires each of us to accept that folks are different from us and that sometimes that makes us uncomfortable. We need to own our discomfort, confront it inside ourselves, and power through it. Valuing diversity in one's industry isn't just a matter of civic duty or basic human decency, it makes good business sense too. Diversity in organizations helps lead to innovation, product development, and expanding your market share. At the end of the day, any real business person should be looking for opportunities to grow their customer base and meet the needs of their clients. Google and other digital marketing platforms have turned the marketing world upside down in the last decade and a half. The days where you could just blast society with advertising and rely on classical conditioning to brainwash customers are coming to a close. Daniel Alegre, President of Global Partnerships at Google, posted on Google's DoubleClick Advertisers Blog, that that Google has been forging new relationships to advance programmatic ad insertion into various streaming media television platforms such as Roku. Google's innovation means that folks who stream media through boxes of some kind (Roku, tablets, game consoles, etc.) are likely to see ads that are not only more targeted based on demographics, but also based on their interactions with other media. This targeted media is huge for content strategists, because not only do you need to know who your target audience is from a demographic angle, but need to be aware of their attitudes, perspectives, and values. Susan Wojcicki, CEO of YouTube, recently published an analysis of consumer engagement around YouTube ads with empowering messages aimed at women and ads were some of the top performing ads for the periods under analysis. In other words, knowing the diverse audience in front of you allows you to connect more authentically with them. We encourage anyone who took the time to consider our thoughts to share this post with someone you know and use it as a conversation starter to talk about diversity in your world of work. Don't be afraid to have open and honest conversations about it and make an effort to have respectful conversations to build your network. Don't worry about folks being offended about wanting to discuss the issue for fear of being labeled gauche, ignorant, or bigoted. Just stick to the Golden Rule and you will be fine...and you never know when you might find a new business opportunity in a place you never thought to look before.